As indicated by Road and Travel Magazine, 78% of pet owners are hitting the sky and ride the roads with their four-legged companions. Ever increasing number of individuals are traveling these days and taking the family dog. The Chihuahua is a toy breed that is one of the most famous and well-loved among many breeds. They are small and compact dogs that make for fantastic traveling companions. Traveling with your Chihuahua can be a fun and pleasant experience for you and your family. Many folks today prefer to take their dog along on family vacation or when traveling instead of putting them in kennels or having someone else pet sit them. 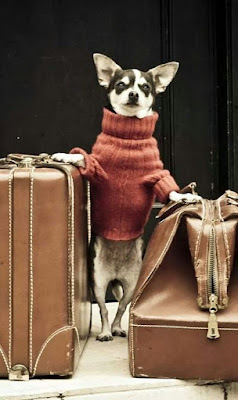 Before you decide on traveling with Chihuahua, the following are the pros and cons of traveling with your Chihuahua. During my recent trip, I discovered that the costs of my hotels and the cost of a puppy day care centers were below the cost of boarding my dogs for a week. It is true that having our dog with us was really more profitable! Traveling with your dog gives the appearance of a local rather than a tourist. Because you have your dog with you, many assume that you must be local. A lot of time, individuals strolling dogs will get asked for directions by tourist. When you are treated as if you lived in the area along, you get a different perspective of the city or town you visit. Personally, whenever I am in a new town or city with my Chihuahua, I cannot stop making friends. Folks will picked up my dog, kiss her face and ask about her name. If you are traveling, particularly alone, going with your dog can help you feel safe. When staying in a hotel and in case, someone breaks in, you will have your dog there who can alert you as Chihuahua is an excellent watchdog. Your brave and courageous little dog will notify you when strangers enter the house. In addition, you can feel safer with a dog while exploring the sites of a new city. And having a dog makes it much less likely for someone to pickpockets or scam artists to target what seems to be a local walking their dogs. Not being able to leave it in the van for long periods can be very difficult especially during the summer, while leaving Chihuahua in the van for a minute can lead to a heat stroke. As dogs are not allowed in most supermarkets. This is one of the reasons I gave up going to the shops because I always have trouble finding a shadowed spot for my Chihuahua. Chihuahua puppy is very fragile, small and delicate. Their bones can break easily if they fall. Because it is so small, it is sensitive to low temperatures. Traveling with Chihuahua requires extra care; rough handling of your puppy can be injurious. Dog hair, dog kibbles, and dirty paws imprints scattered on the floor and you will have it all. Despite all the efforts to clean it, it is always embarrassing and inconvenient seeing dog hair, kibbles and dirty paw marks around the hotel room or someone's house.